Digital information is integral to the fabric of our daily life. Mixed- and augmented realities (MR-AR) are emerging technologies that will have profound effect on how we perceive and interact with digital information. As compared to the better-known virtual reality (VR) paradigm, MR-AR technologies seek to selectively supplement, rather than replace, the physical environment with digital information. 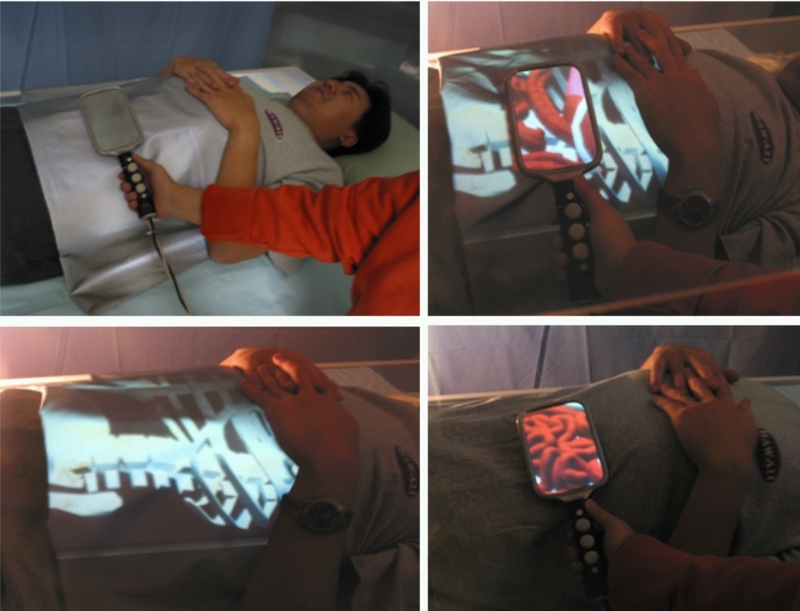 The figure below demonstrates an example where a physician, wearing a see-through head-mounted projection display, sees a 3D rendering of a skeleton model as well as other anatomical structures superimposed onto a patient’s abdomen. The 3D rendering of the images remains constantly overlaid with the patient, allowing the doctor to see into the patient as if he had “X-ray vision.” The digital information becomes an integrative part of the physical environment. Such a visualization tool empowers diagnosis, surgical planning and guidance, and training. Mixed- and augmented reality techniques will soon provide a means to enhance our perception of the real world in many daily tasks and thereby improve our convenience and appreciation of the world. The research in our group addresses the many technical challenges in creating mixed- and augmented reality applications. There is a critical lack of advanced display technologies and a dearth of adequate visualization methods and interaction techniques. 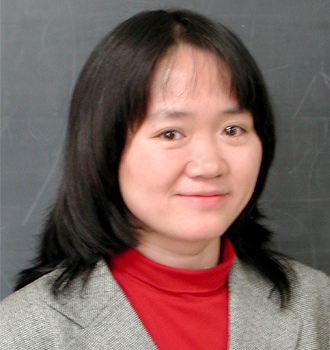 Responding to these needs, we have been focusing on the development of two- and three-dimensional (2D/3D) display systems, 3D visualization systems, 3D human computer interaction methods, and image acquisition systems. We are also interested in applying these technologies in medicine, scientific visualization, and education. In terms of long-term vision, we are interested in creating interdisciplinary technologies on the boundary of human vision, machine vision, and information technology, to enhance environments in which we work and live.